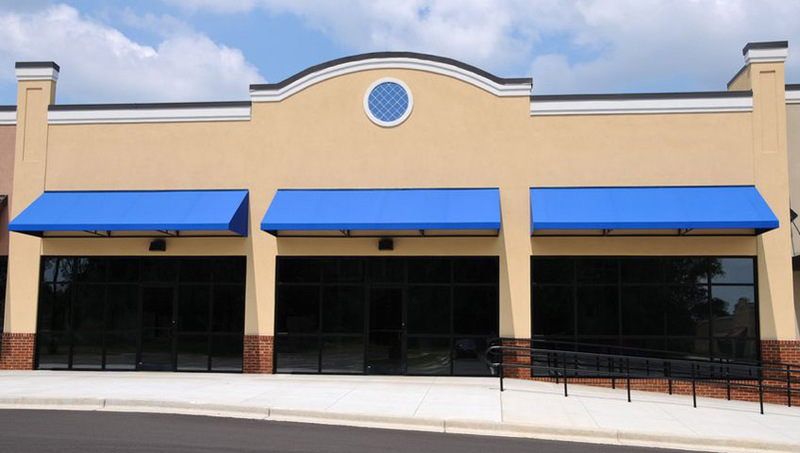 Gatorshield® (a special Flo-Coat® product) is considered the "desired product" for awning frames. We are the nation’s largest distributor for Gatorshield®. Higher strength material (50,000 psi min yield) means that wall reduction is possible yet giving same strength requirements. Lighter frame means less support, less freight, fewer people to install, etc. Other steel tubing is typically (40-42,000 psi yield). Additional coatings over the zinc allow for field painting or powder coating® without having expensive surface preparation. 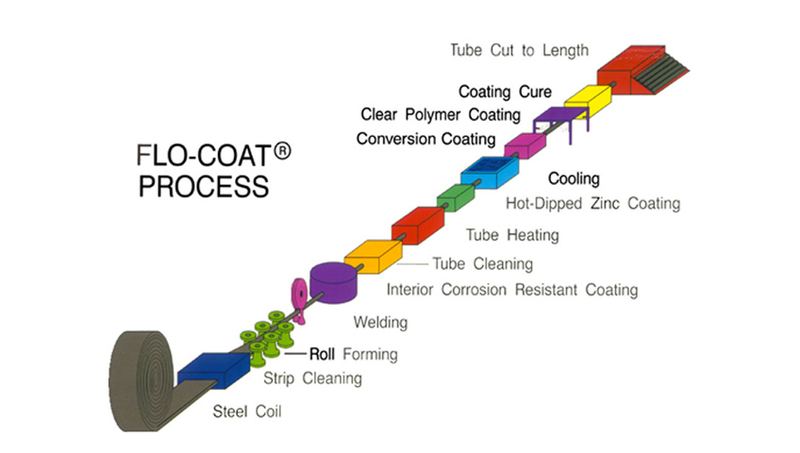 Other steel tubing is typically protected with oil or other quick dry coatings that paint will not adhere to. Fabricators / Installers are able to field weld with less expensive equipment than required on aluminum. Aluminum requires special equipment as well as the process emits ozone gas which is harmful. Welding on Flo-Coat® product is very safe and does not promote "welders flu" as many other products do. Any other galvanized product is going to contain up to 30% lead in the coating. Can't or Don't want to Weld: we stock Kee Klamp® fittings. Aluminum pricing is unstable and can fluctuate weekly or monthly as great as 10%. 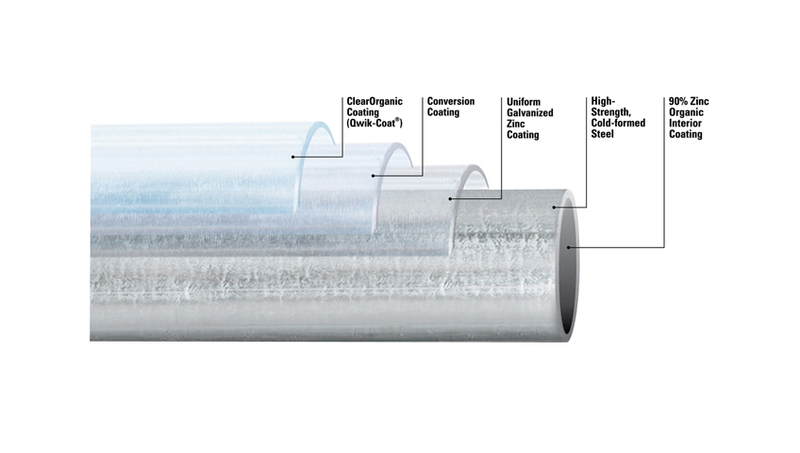 Flo-Coat® is much more stable and will typically only fluctuate 3-4% over a years’ time. Aluminum is half the strength of Flo-Coat and when welded, loses half of its strength in the welded zone. Because of this, all engineering has to be done taking this into consideration. Although aluminum is a lighter metal, adding all the additional structural members to get the needed strength will eventually make the frame very heavy. Gatorshield® is available in 20ga wall thickness in selected shapes which means that it too can be used for a "stapled" system. It also has the same weight per foot of the thicker walled aluminum but with higher strength, this will actually net a lighter weight frame than using aluminum.